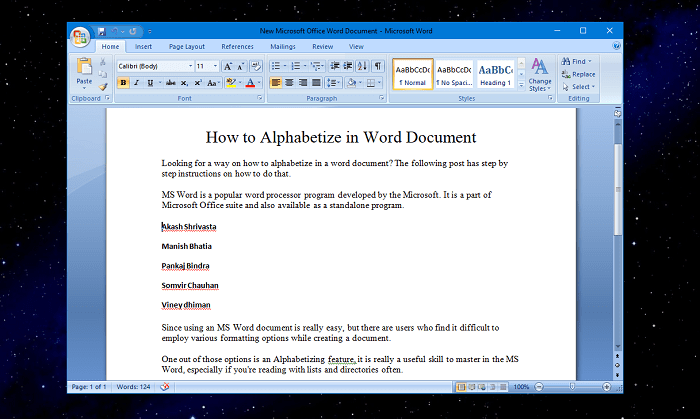 Looking for a way on how to alphabetize in Word document? The following post has step by step instructions on how to do that. 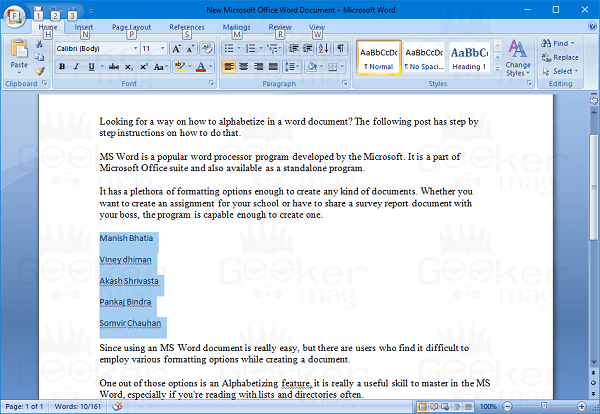 MS Word is a favorite word processor program developed by the Microsoft. It is a part of Microsoft Office suite and also available as a standalone program. It has a plethora of formatting options enough to create any documents. Whether you want to create an assignment for your school or have to share a survey report document with your boss, the program is capable enough to create one. Since using an MS Word document is easy, but some users find it difficult to employ various formatting options while creating a document. One out of those options is an Alphabetizing feature; it is indeed a useful skill to master in the MS Word, especially if you’re reading with lists and directories often. The good thing is that sorting a list alphabetically is super easy as you just have to make a click or two to use the option. In the upcoming lines, you will read step by step instructions on how to sort a list alphabetically in Word. 1. First of all, you need to open the Word document in which you want to Alphabetize text. In case, you don’t have the Word file, and you just want to learn this feature, then create a new word document. For that, right click on the desktop and from the context menu select New -> Microsoft Office Word Document. 2. 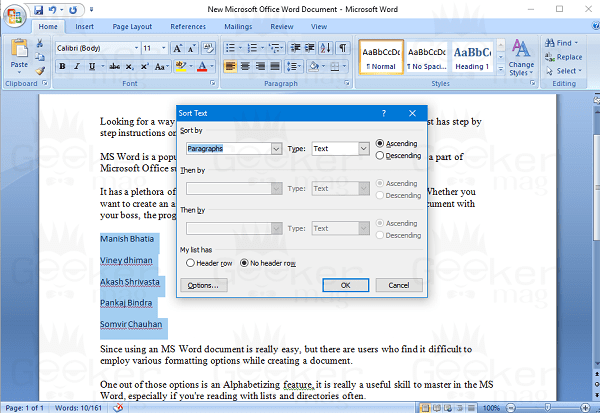 In the text document start typing and create a list of words which you want to Alphabetize in the same document. Note: Keep in mind that, the words which you want to sort alphabetically in the document required to formatted as a list, each entry need to have its line. 3. Once you have a list, just make a selection of the Words which you want to Alphabetize. Note: In case, the Word document only has a list then there is no need to make a selection. It is required only if the list in Word document is the part of a larger document. This will launch the ‘Sort text‘ window. With default settings, the Alphabetize process will happen by Paragraph. Next, to this, you will find two radio buttons, i.e., Ascending or Descending. You need to click on the one to choose how the list should appear. The rest of the steps are similar to the steps discussed above for Word 2007 or above. 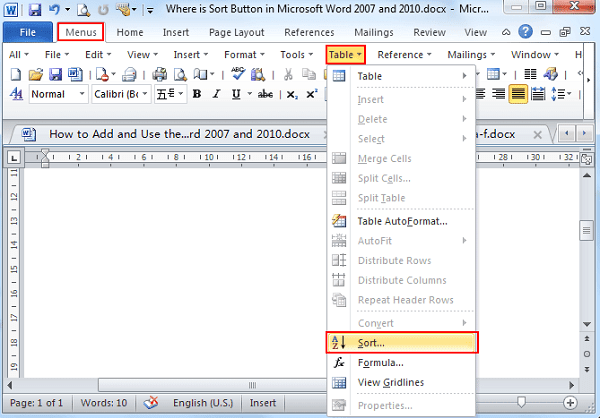 I trust you will find my this blog post on how to Alphabetize in Word Document useful. If you want me to write a tutorial on any other MS Word document, feel free to share it in the comments. Previous Post« Previous Fix: Windows 10 Start Button Not Working?